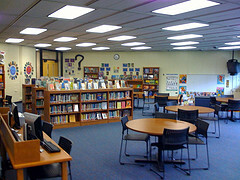 About the BF LMC - Welcome to the Brook Forest Library Media Center! The Library Media Center is open Monday - Friday from 8:00 - 3:30. Would you like to be a Birthday Book Buddy? With a Birthday Book donation of $18.00, your child can select a book to contribute to the Library Media Center. Every donated book will have a name plate added with your child's name and birthday. On your child's birthday, their book selection will be mentioned during the morning annoucements. If you are interested in partcipating in the Birthday Book program, please download a form and turn it in to your child's teacher. Please make check's payable to Butler School District #53. The Brook Forest Library Media Center has the print and electornic resources to help you with daily assignments as well as research projects. Mr. Schu and Ms. Bishop can assist you in becoming effective and discriminating users of information. *Provide instruction in information literacy including the use of library information, materials, and equipment. *Provide help and resources for assignments. *Provide resources and activities that foster lifelong reading and learning. *Twenty-two networked computers for student use with access to student files, software, and the Internet. *Videos, DVDs, VCRs, Cameras, and an Interactive White Board. *Reference works: Encylopedias, Atlases, Almanacs, and Dictionaries. Greetings! My name is Mr. John Schumacher (AKA: Mr. Schu). This is my tenth year at Brook Forest and fifth year as the school librarian. I love every moment in the library. “The secret in education lies in respecting the student”. One of my ISU professors once shared this quotation by Ralph Waldo Emerson. It succinctly expresses my philosophy of treating my students with respect and dignity. For me, teaching is about reaching the individual learners, no matter what it takes. I create a learning environment where children feel safe and comfortable, yet daring enough to take risks. One of my teachers once said, “John, the effective teacher never forgets what it is like to be a student.” This is something I always consider. My professional goals are to educate myself in a myriad of areas; to integrate materials into the Library Media Center and communicate it to my students, faculty, and staff. I want children to believe in themselves, and realize that they can set their own goals and achieve them. Why did I decide to become a teacher/librarian? As a child I was constantly fascinated by my teachers and the relationships we developed. I declared to my parents in first grade that I wanted to be a teacher or a librarian. Now I am both! One can say there was no choice; it was an innate decision.